eighty per cent of the rural population and 55 per cent of the urban population in India are not aware of the Right to Information, or rti, Act. Half of the public information officers are not trained in implementing the act. Only one in four persons seeking information gets it. These are the findings of three assessment reports released recently. The reportsone of them sponsored by the Central governmentcall for strengthening the act and point out bottlenecks that severely hamper its implementation. They come at a time when the government is trying to dilute the four-year-old act by proposing controversial amendments (see RTI in reverse gear, Down To Earth, November 1-15, 2009). One report was prepared by global consultancy firm PricewaterhouseCoopers (PwC) hired by the Department of Personnel and Training that coordinates personnel matters for the Central government. rti advocacy groups objected to the selection of PwC, saying it is linked to controversial water privatization projects and the Rs 7,000-crore Satyam scam. They launched their own study and released its executive summary in August. The third report, released on October 22, was prepared by the Public Cause Research Foundation in Delhi, which researches and disseminates information on governance. Activists initial suspicion of the PwC study notwithstanding, all audits have reported similar findings (see State of RTI). Magsaysay award winners Arvind Kejriwal and Sandeep Pandey, activist Anna Hazare, and Zee TV owner S Chandra have written to the prime minister, requesting that former IPS officer Kiran Bedi be appointed the chief information commissioner of the Central Information Commission. Bedi is known for her no-nonsense approach to work. The post fell vacant when Wajahat Habibullah resigned from it last month. Commissioners M M Ansari and A N Tiwari are also frontrunners. But an analysis by NGO Parivartan showed their performance in 2008 was not impressive. Of every 100 people who filed appeals before Ansari, 15 got information. In case of Tiwari it was 16 per cent. 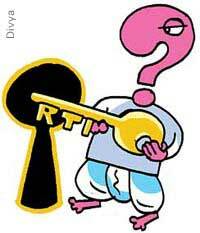 The PwC report estimates the total number of rti applications to increase to four-five million by 2011, up from the 2008 estimate of 0.8-0.9 million. This would result in the emergence of new problems of processing capacities of the organizations to meet the demand, warned the report. To meet the future demand for information the government will have to quickly expand and better train the administrative staff, recommended the PwC report and the report prepared by 11 ngos under the banner of rti Assessment and Analysis Group (raag), and the National Campaign for Peoples Right to Information (ncpri). PwCs other recommendations are introducing a third party audit; setting up an rti call centre for filing applications and complaints over the telephone; and a national rti portal for submitting rti requests online. The study by the Public Cause Research Foundation showed 27 per cent of the applicants got the information. Karnataka got the highest rating for public satisfaction, with 55 per cent applicants happy with the functioning of the information commission. At the bottom was West Bengal, where 6 per cent applicants were content with the response. The foundation studied the acts implementation across the country, except in Uttar Pradesh, Tamil Nadu and Sikkim. The audit found 39 per cent of orders by commissions for disclosure of information were complied with. Only 2 per cent officers against whom a violation of act was established, were penalized. Enforcement is clearly weak.